Price reduction before going in the garage. 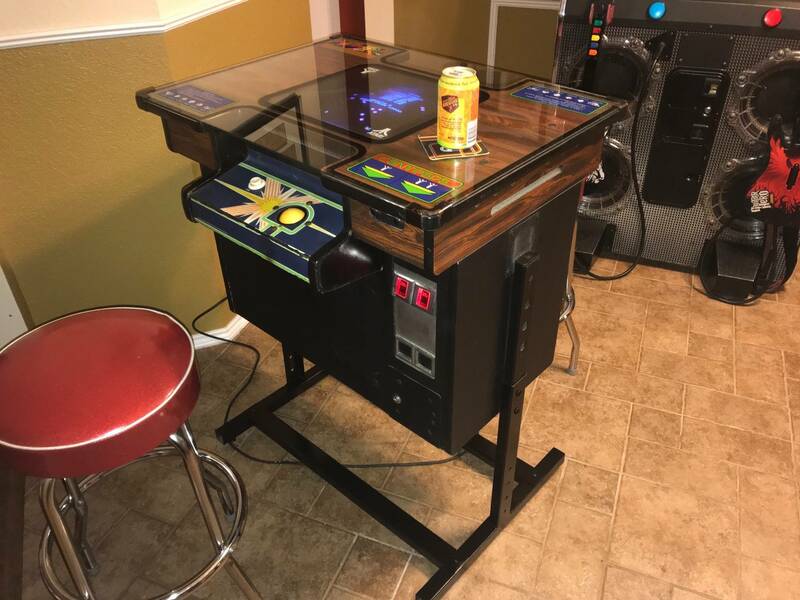 Up for sale or trade is a nice Atari tempest in cocktail form. Has a freshly refurbished board set from a very reputable klov member. Board has tempest v1, v3, tubes and a breakout game. Wg6100 is freshly capped and bullet proofed with a new lv mod. I've never seen one of these, very cool, bump. I used to have a cocktail Tempest years ago. Now I have the upright, love the side art on that game. I do love Atari cocktails of this era though as they are unlike any other cocktail where you can adjust the legs to barstool height. Same could be done on your tempest. Here is how my Centipede resides. It's such a cool game for sure, I'm just trying to move it along to someone that is looking for their Grail game. Everything is cheaper in Idaho bump. The brutal reality is that color vector stuff is hard to find, hard to fix, and hard to keep working, unless you babysit the machine(s). Helps keep prices high. I've owned nearly every single one at some point and speak from 18 years experience fixing them. Why or WHYYYYYY did I not buy that Space Duel cocktail 4 years ago for $600 (with a capped, original monitor). I haven't broke into video game collecting, but this would be a good place to start if it was local. So much class in Atari classics.. I'm mostly in the vid side of things, but only cocktail cabinet projects I have are Atari Football and Joust. I'm really mehhh on most cocktail cabinets, but the Tempest (and Space Duel) were REALLY well done and interesting to look at. Just a reminder though, this is a freshly gone through board set with extra ROMs that are user selectable. Completely gone through wg6100 crt with all of the bad design features fixed. New Atari big blue cap. I'm also open to pin trade offers or other vector based vids. 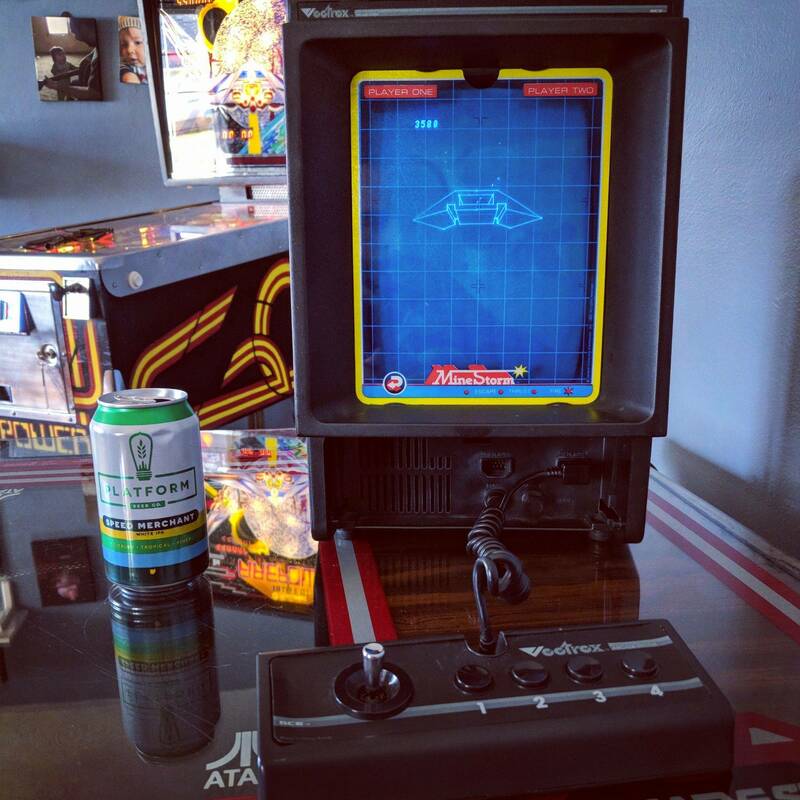 How about a Vectrex for trade? Comes with a 101 games (vector based) multi-cart and a light pen. 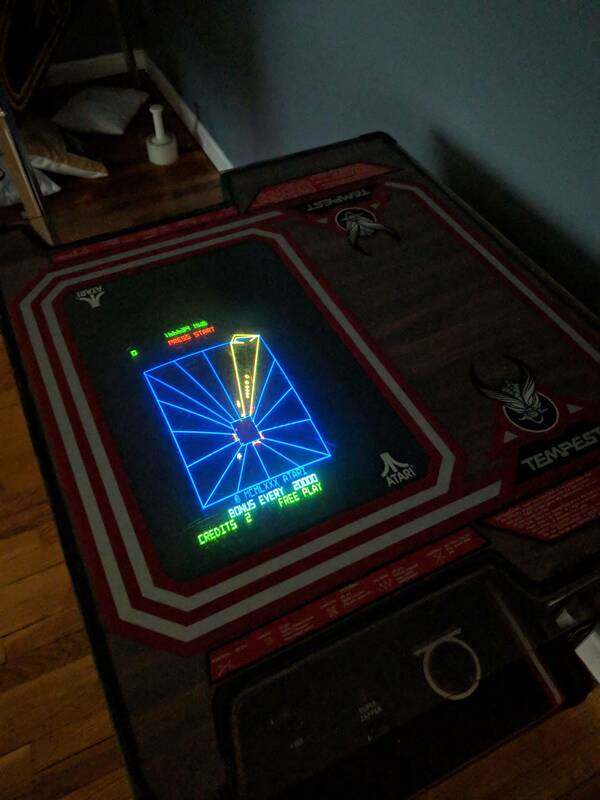 Tempest used to be my favorite game. Loved whipping that spinner around. 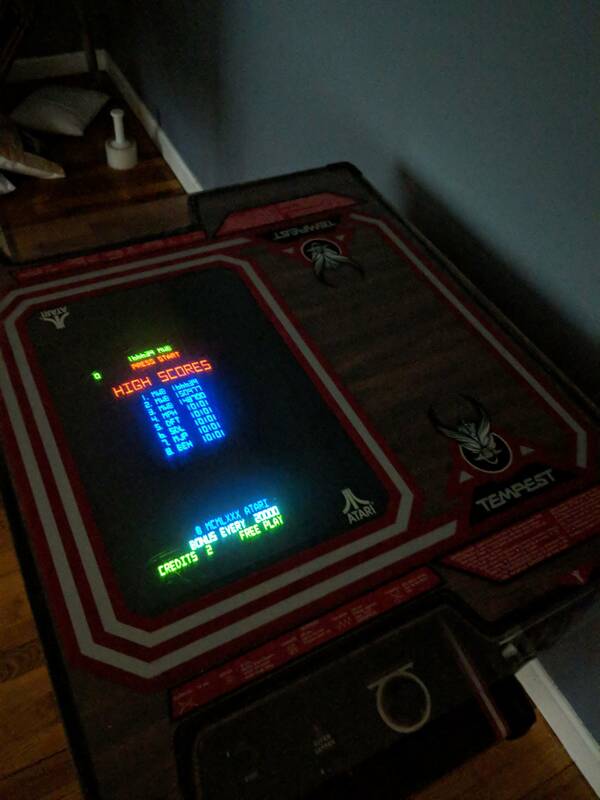 I have a multicade with Tempest on it...it's not the same without a spinner. If it weren't for location x 2 (location of the machine now and where I would locate it once I got it) I would be sending you a PM. Anyhow, bump for great game. Seems it's all crickets in here for trying to sell/trade it though. 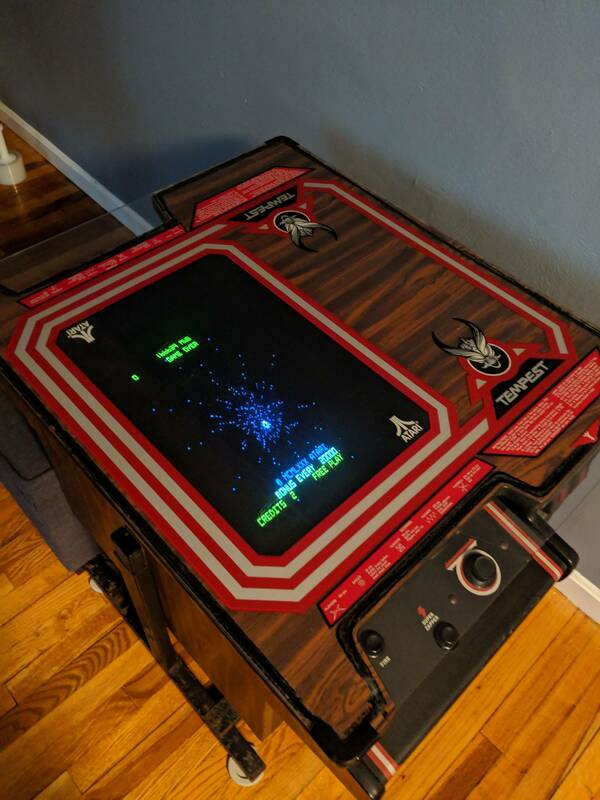 I'd buy it but then my wife would kill me for not buying her a Galaga cocktail machine all these years! I had a Space Duel cocktail, love those color vectors! Man i wish i had the cash....me likey. I had a really nice one of these about 15 years ago. Probably my biggest regret in getting rid of game. Great game! Something about color vectors are just stunning! 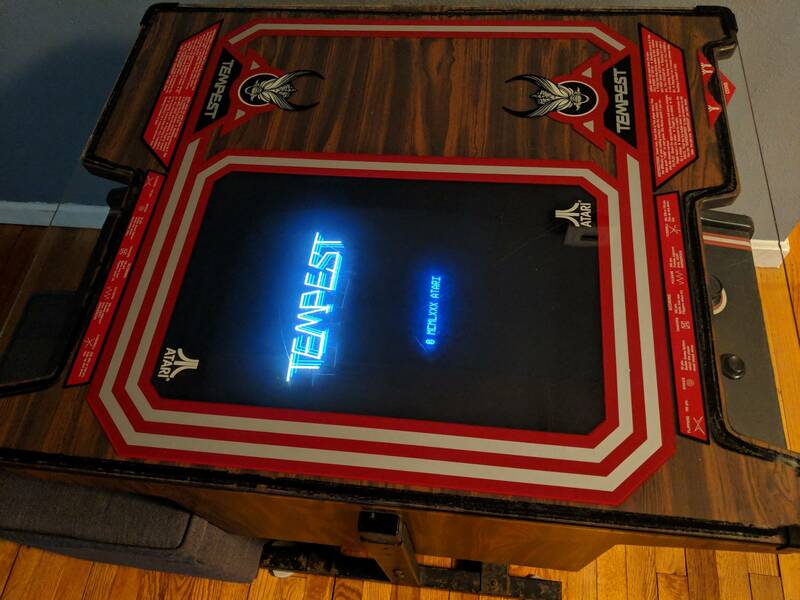 Does the cocktail Tempest have a larger screen than the upright? No, it's the same exact size- which is why it's a rare cabinet. Most cocktails use smaller crts. This is another cool thing about the Atari cabarets too. Most cabaret and cocktail games have a smaller monitor. This Tempest along with Space Duel is the exception. Not sure what you meant here. I just want to sell this thing. Anyone near me want to make a decent offer?!? Ugh I may have to make the drive I’m afraid...someone pllllllzzzzzzz buy it now. It is! So crazy no one has really moved on it yet. I'm just needing the space otherwise it would be staying. That’s an insult offer. You can’t even buy a fully working color vector monitor for $600 these days. The seller asked for offers. If you don’t like an offer made via PM politely decline via PM rather than posting the private message and calling it an insult. Best of luck with the sale. I did indeed ask for offers- decent offers was the exact language used. 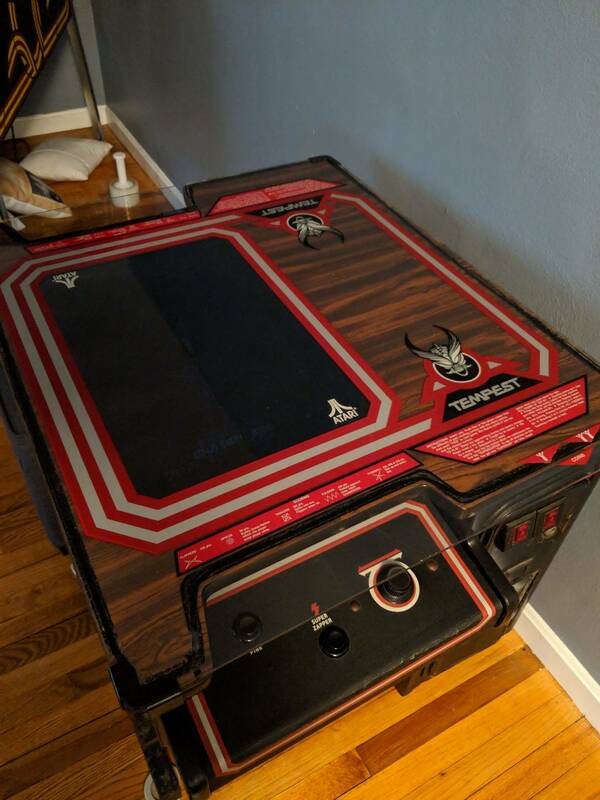 If the person messaged me with a little backstory as to why he or she feels that $600 is a decent offer for a nice condition tempest cocktail- I would be all ears and I would not have used there message as an attachment for all to see. I guess what it comes down to is- my version of polite is probably grossly different than yours. I consider myself polite and I generally go out of my way to help everyone I can at the cost of my own time and sometimes money. My opinion was and still is that the message was rude. I'm surprised no one grabbed this yet. I have an Asteroids cocktail game with the multiboard in it and love it. If I wasn't 10 hours away this would probably be sitting next to my Asteroids cocktail by now. I used to have a Space Duel cocktail that I regret selling. This board set isn't even a "multi-board" that you can purchase. This is a modded board set from Andrew over on Klov. The breakout game that's in the ROM set is a game that clay programmed! 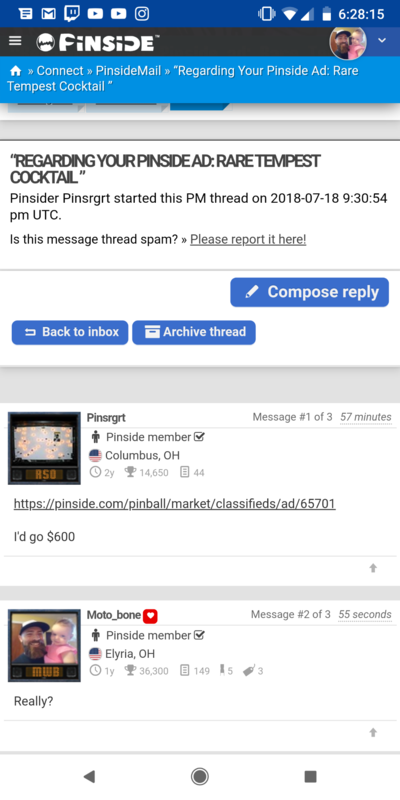 I just use Pinside now to watch this thread in hopes someone wants that awesome tempest. It is the case, however, that this is a pinball forum... maybe you'd have more luck on KLOV? Last bump/price reduction and then it's going in the garage. Anyone want to nab a tempest cocktail??? ?